Zombies. They have become the horror genre’s heavy hitting monster. They are as worldwide as air. There’s Max Brooks with his World War Z and David Moody with his Autumn series. Then there’s Eric S. Brown, zombie expert. He’s written hundreds of short stories about the pesky undead creatures with a hunger for brains. He’s written several novels about them as well. Look his name up and you’ll find pages upon pages of publications. He’s also one of those writers that I started reading a few years ago when I first started into this business. I became a fan of his quite fast. But, with all he has put out, he continues on, writing about the living dead and doing it with flair. It is my honor to have Eric strapped in and a needle poked into one of those living veins of his. Who is Eric S. Brown? ESB: Eric S Brown is a 35-year-old geek addicted to zombies, horror films, and comics. I started writing horror nine years ago and am still doing it today. I have sold 28 books, several chapbooks, and hundreds of short stories. Some of my latest books are Bigfoot War and Season of Death. In Dec. 2010, I will have finally made the switch from being a small press veteran to a mass market rookie as Simon and Schuster will be releasing my novel War of the Worlds Plus Blood Guts and Zombies. My career tends to be my life other than my family. I find it hard having fair time for both. I have been married to the same beautiful and amazing woman for over ten years and am the father of an extremely gifted five-year-old son. AJ: Twenty-eight books? Wow. That is an impressive number in and of itself, but in the span of nine years… that’s amazing, Eric. Before we go into your novels, let us talk about your addiction: zombies. First, what is so appealing about the zombie genre and have you sought help for this addiction?? ESB: I have loved zombies since the first time I watched Night of the Living Dead and Dawn of the Dead as a child. I love that end of the world, struggling to survive, and “last man” fantasy element in Z stuff. That combined with the fact that zombies are a great sub genre of horror to write in because what you can do and say with them, in terms of settings and themes, is pretty much endless. AJ: With your love of zombies, are you a fan of Max Brooks’ World War Z? ESB: I really enjoyed World War Z up until the end. The ending was a bit happy for my taste. I am more of a fan of Z viruses/plagues that DON’T have a happy ending. Loved The Survival Guide though, through and through. AJ: I thought the way Brooks put the book together was something close to brilliant, but I see what you’re saying about the ending. It was a neatly wrapped package. I’ve read a few of your zombie stories going back the last five years or so and the writing is straightforward and active. When you started writing zombie stories, did you draw from The Living Dead series as a whole or did you tinker with the stereotypical zombie to create your own style? ESB: My very first story I ever submitted was a Z like tale. Around 2003, I pretty much started only Z stuff as far as the bulk of what I wrote. I messed around with every thing zombie I could. I had slow movers, fast movers, intelligent dead, animals, zombies tied to demons, etc. My book World War of the Dead is about a zombie apocalypse in the middle of WWII for example. Tanks, Nazis, zombies and folks with super powers all in one novel. Unabridged, Unabashed and Undead: The Best of Eric S Brown is a great book to check out a good bit of my Z short stories. It contains 47 tales from the early days of my career. Season of Rot (a collection of five Z novellas) remains the fan favorite book though. AJ: You bring up some of your early works—zombie tales of every shape and size—so let me bring up Bewildering Stories. It’s the first place I read an Eric S. Brown story and it was right at the beginning of my pursuit of writing seriously. I remember thinking that you had a lot of stories there and that you were on to something to be published that many times by one place. I tried to write like you with action being one of the key elements to your stories. It didn’t work for me. I tried several times and the words didn’t sound right. Your blend of action and just enough descriptions to move a story along work for you. Did you develop this style or is this the way you started our writing—with fast, action oriented stories? ESB: I love the works of H.P. Lovecraft, but I grew up reading David Drake too. Drake is a long time hero of mine. His Hammer’s Slammers books were where I learned about writing and its flow. Between reading Drake and so many other action oriented Horror and SF books like The End World series, combined with the fact that I am a film and comic geek, and I guess it was only natural for me to develop that kind of style. AJ: Eric, you’ve written quite a few novels over the last few years. You have a couple that have come out recently. Can you tell us about those? ESB: World War of the Dead was one of my books that came out last year. It was the tale of a demon based Z virus that swept across the globe during WWII. I took a chance with it because as much as it’s a Z novel, it’s also a book about faith. I am a Christian and I wanted to do something that was based in my faith for once. The Weaponer, which is coming out soon from Coscom Entertainment is another newer Z book of mine. It’s a Z tale set in a post-apocalyptic future where humanity has descended into an old west lifestyle and level of tech once more. You have to think Clint Eastwood’s Man with No Name and Mad Max meets Dawn of the Dead (2004) at the same time to get it. The main character is a bit of both. 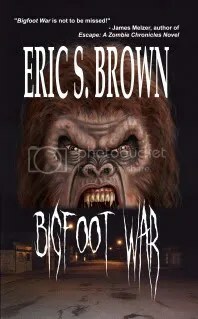 The book I am proudest of though is Bigfoot War. It’s my answer to all those Bigfoot movies that only have one monster and maybe alludes to more at the end. Bigfoot War is the first book in a series that I hope redefines the Bigfoot mythos and takes it to a new, end of the world level of terror. It’s the most personal book I have ever done in the sense that it’s based on my own childhood fears growing up in the rural south. Bigfoot War II is slated for release next year. AJ: What exactly were the fears that led to Bigfoot War? ESB: As a kid, I lived in a very secluded little area. Trees and nature creeped me out anyway, as I was a stay inside with a big stack of books and comics kind of child. I was always terrified a big, hulking, hairy monster was waiting in the shadows outside my window at night, ready to tear my head off. So all those nightmares about my version of a flesh eating, super-sized sasquatch went into this book. I also wanted to do a book that featured an entire group of the things, not just one like all the movies. Thus Bigfoot War was born as my ultimate fan/writing for me book. It has a very end of the world feel as sixty or so massive monsters close in on this cut off little town of eight hundred folks and those folks make their last stand. AJ: When you say Bigfoot War is going to be a series, do you know how many books the readers can look forward to or are you going to write the series until it plays all the way out? ESB: There will be three Bigfoot books total. The first two tie together and are set in the same area with the second picking up where Bigfoot War ended. The 3rd shifts gears and re-imagines the Bigfoot mythos even more so than the first two, which feature super large, violent, flesh eating creatures who are tribal and very angry. I am working on the second book right now and it should be out next year. In truth, I hope to see both II and III in the series out next year. The first book is about the destruction of a single town of eight hundred people, the second ups the chaos to being spread all across the south, and well, for the 3rd book, you’ll just have to wait and see. AJ: Ah, a secret for book three. That makes this even more intriguing. Let’s shift gears just a little here, but stick with the novels. You have another one coming out soon, totally unrelated to Bigfoot War, right? Can you tell me a little bit about it? ESB: In terms of novels, War of the Worlds Plus Blood Guts and Zombies will be re-releasd by Simon and Schuster on Dec. 14th. Also, my first ever superhero book, The Human Experiment, will be out from Sonar 4 Publications in Dec. as well. It’s a busy month for me as Naked Snake Press will be tossing Martin Kier and the Dead (a paperback, novella sequel to Season of Rot) onto the market then too. I am really excited about Martin Kier and the Dead as it picks up right where Season of Rot’s title story concludes and tells you what happened to Martin in the wake of the explosion that looked like he died in. He’s still very much alive but now stranded in a city full of the dead. The novella reads like an extended running battle between a “super soldier” and thousands upon thousands of zombies that doesn’t let up. And in 2011, Coscom Entertainment will be releasing The Weaponer. It’s my craziest Z book yet. It’s a future western. As in the Z virus destroyed the world but some of humanity lived and rebuilt to an old west stage but now the zombies are back! AJ: WOW! That’s a lot to digest all at once. Four huge projects coming out all at once. Congratulations on the success. Fans of Eric S. Brown have a lot to look forward to. With all that is going on, where do you go from here? What’s your next step? ESB: Currently, I am staying busy interviewing Z authors for my ongoing blog series at Naked Snake Press where I have already interviewed folks like Craig Spector, Joe McKinney, David Moody, and Jacob Kier of Permuted Press. As to the future, I’ll be doing what I always do: Writing. Thank you for the congrats, but it’s really all about hard work and faith. Next year, I hope to finally see the publication of my joint book Anti-Heroes with David Dunwoody from its publisher. They’re been running behind with it but Lord willing they will get it out soon. I also will be completing the other two Bigfoot books and I hope to write yet another Z book next year. And you can find Z short stories or interviews by/with me in anthologies like Monster Mash, Rotting Tales, Gone with the Dirt, the upcoming Deep Horror anthology from Dark Silo Press, and the upcoming nonfiction book Halloween Nation where I am interviewed as an expert on the Zombie genre. AJ: Eric, I think you hit on something I’ve told many new writers over the last couple of years: Hard work will get you where you want to go. Before we wrap this up, I have to ask you, what do you think of The Walking Dead series? ESB: So far, I love it. I think it’s stayed pretty close to Kirkman’s comic series and the guy they got to play Rick is awesome. To me, it’s like he stepped straight out of the comic and onto the screen. I am glad they picked it up for a second season already and really look forward to things to come if it continues to follow the comics. AJ: Before Herbie takes that needle out of your arm, where can we find Bigfoot War and really anything else Eric S. Brown related? ESB: You can find most of my books at places like http://www.amazon.com and http://www.bn.com. Of course, War of the Worlds Plus Blood Guts and Zombies from Simon and Schuster should be available at your local bookstore as well when it hits.